Home / 1930s / J. P. Morgan’s former yacht CORSAIR sailed as a deluxe cruise ship from California to Mexico until disaster struck in 1948. 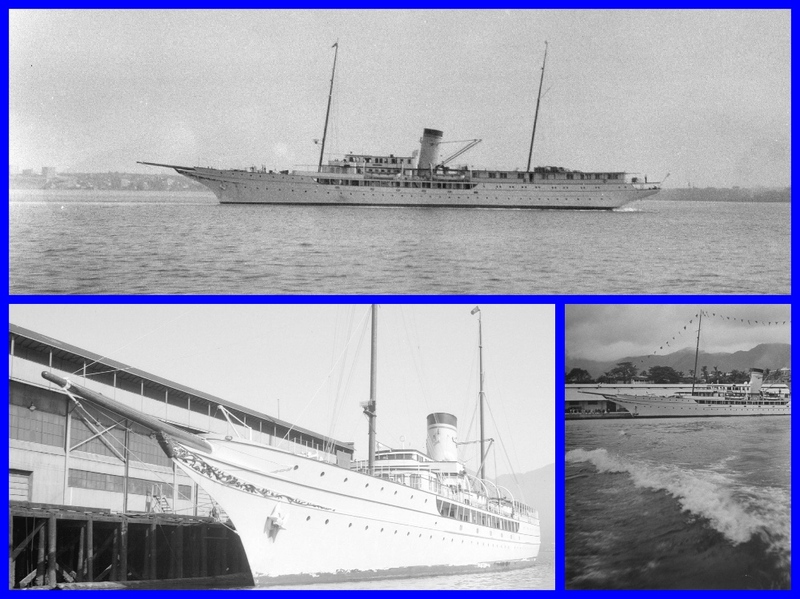 J. Pierpont Morgan Jr. could never imagine his yacht Corsair IV would be turned into a deluxe cruise ship just after World War 2 whose short career with voyages from California would end in tragedy, but it happened. 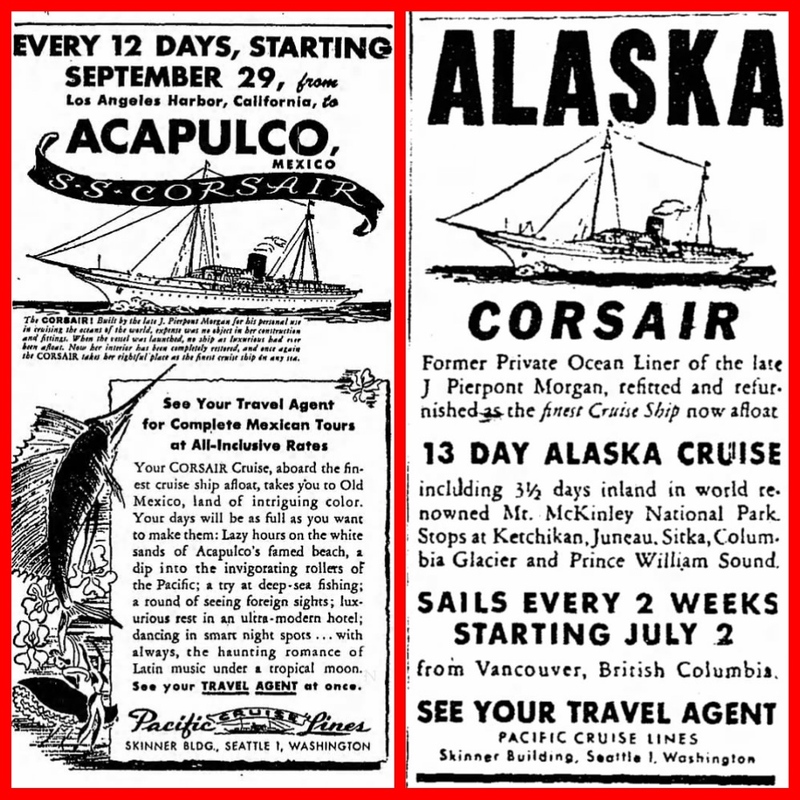 CW The NEW Cruise Yacht CORSAIR – Sailing up the coast of California; In Acapulco; in Vancouver. 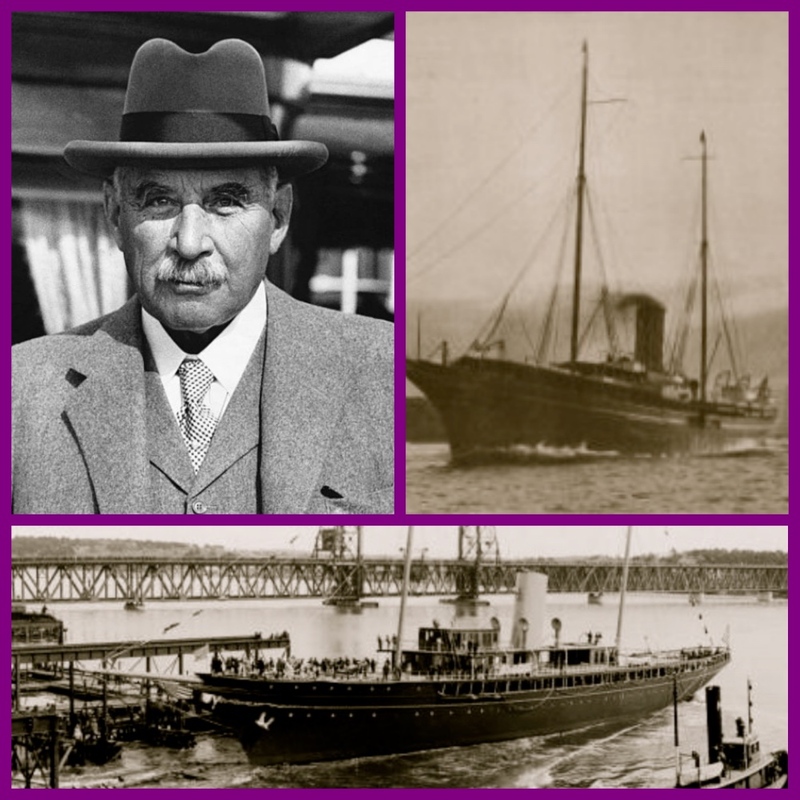 J.P. Morgan Jr. and his legendary business tycoon father, J. Pierpont Morgan, owned four yachts christened Corsair and built three of them. Each yacht was bigger, faster, and more comfortable than the preceding one. CW: J. P. Morgan Jr., Corsair IV, Corsair IV being launched in Maine. Corsair IV was constructed in Maine at the beginning of the Great Depression for $2.5 million (or about $60 million in today’s currency). Measuring 2,142 gross tons, with a registered length of 300 feet and overall length of 343 feet, the Corsair IV was the largest yacht ever built in the U.S. Designed in the traditional piratical look of Morgan yachts; Corsair IV was long, dark, heavy underneath – paler and suaver in the superstructure. When it was ready for launching in 1930, Morgan brought three private railway cars of family and friends up to the Maine shipyards for the occasion. 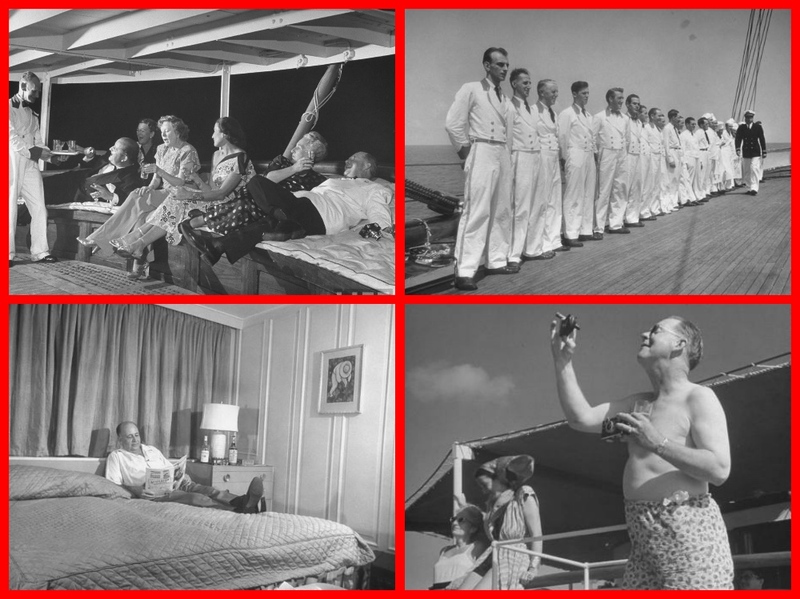 CW: Luxurious Cruise Travel – Passengers on the Aft Deck; Chief Steward inspects staff; Passenger enjoys the sun and takes a photo; Passenger relaxes in his suite. Morgan used her for ten years, mostly on the East Coast, in the West Indies and for trans-Atlantic record-breaking crossings. After an eventful career with Morgan, the Corsair IV was turned over to British Admiralty in 1940. 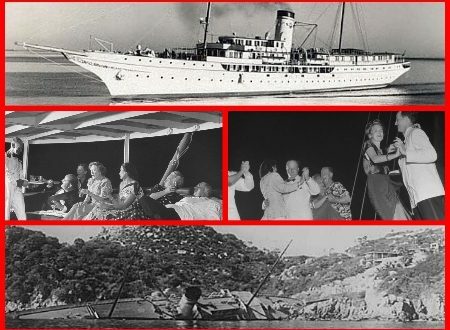 Following World War II, rich Americans had money to spend on cruises, but choices were limited. Half the commercial passenger vessels had been sunk, and the surviving liners demanded extensive refurbishing. It would be several years before many refurbished ships would be back in service or any new ships built. 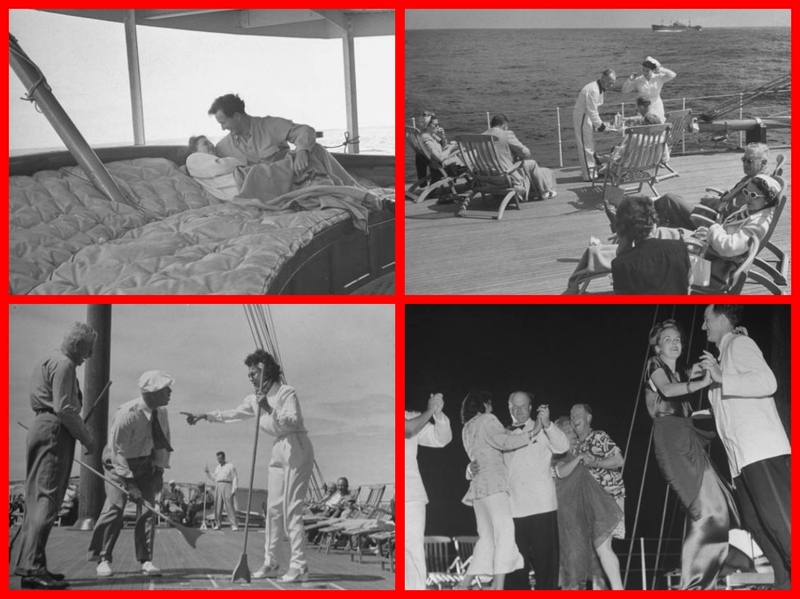 CW: Couple on after deck; Passengers taking the sun; Dancing under the stars; Shuffleboard on deck. This was especially true in California and on the West Coast. 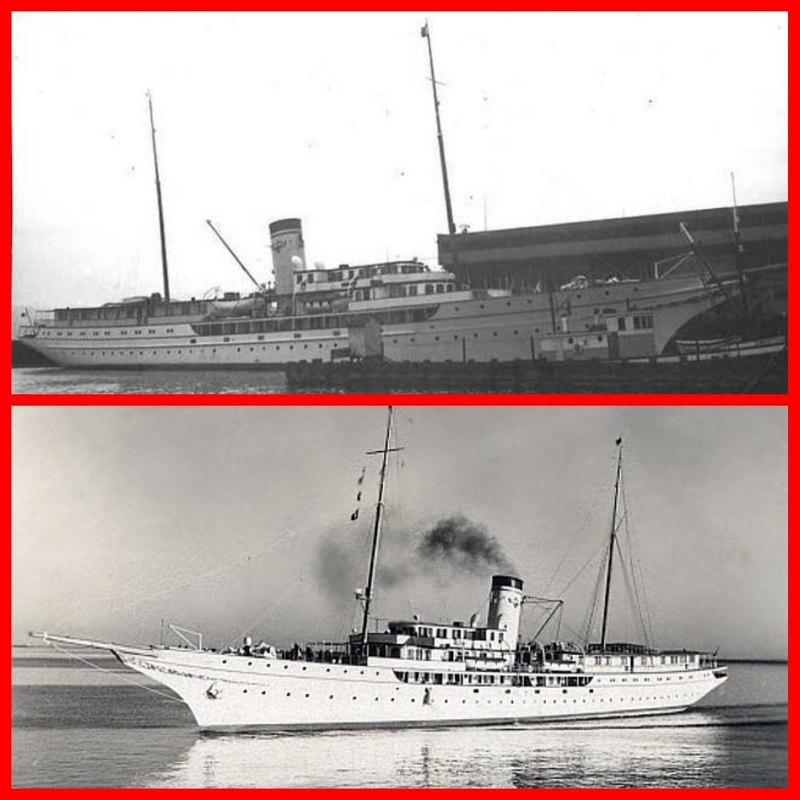 American Presidents Lines took three years to re-establish liner service to the Orient, and it wasn’t until 1948 when Matson Line’s famous Lurline sailed again to Hawaii. 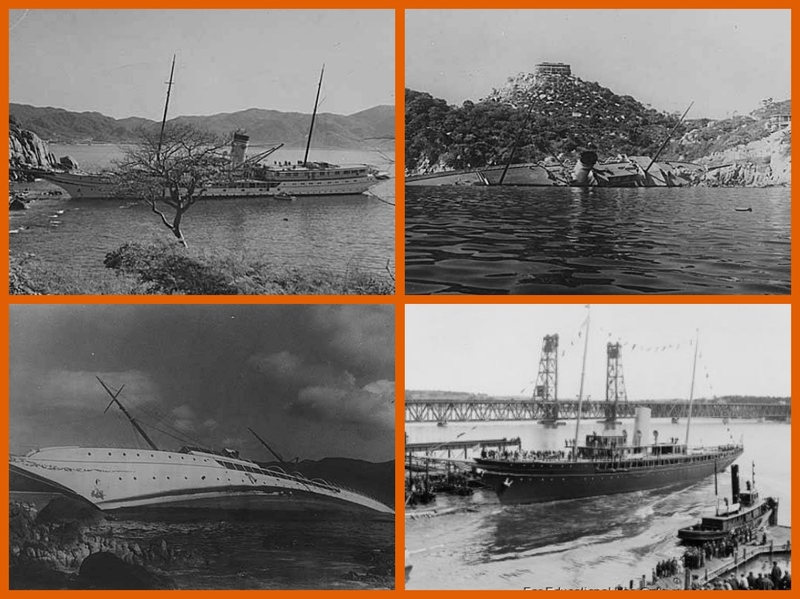 The magnificent pre-war Canadian Pacific and Japanese liners that once plied the Pacific had been brutally sunk in seagoing battles. Folder with cruising fares and schedule to Acapulco for 1949. 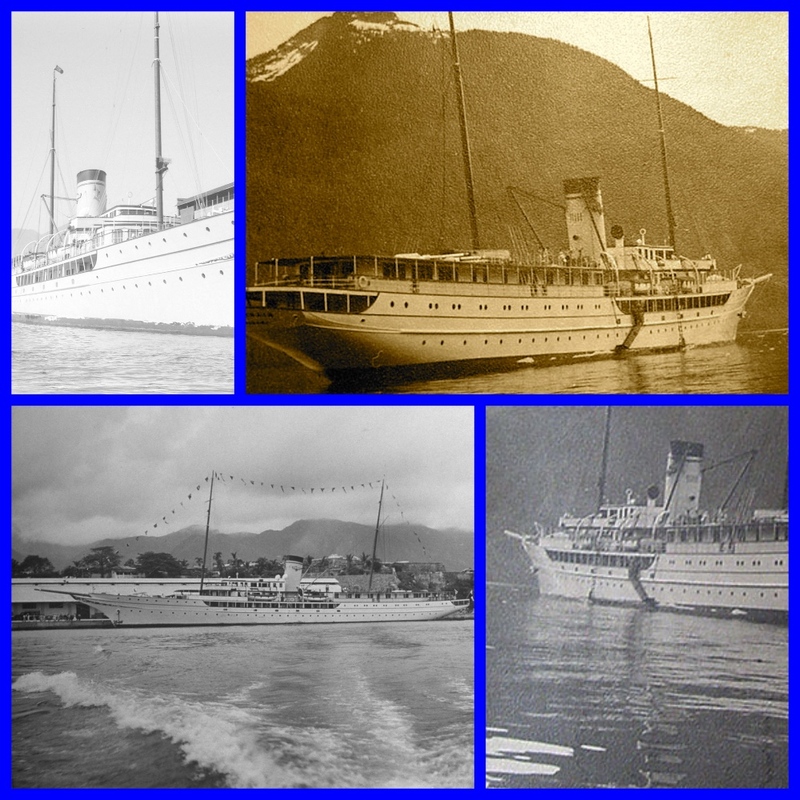 Realizing there was an untapped post-War luxury cruise market, the Skinner and Eddy Corporation, owners of the Alaska Steamship Company, created Pacific Cruise Lines in 1946. The newly formed subsidiary immediately went looking for a ship and was lucky enough to quickly spot its prize, Corsair IV. The former Morgan yacht was bought from undisclosed buyers and placed under Panamanian registry. The Corsair (the IV was dropped) was taken to Todd Shipyards in New York for repair and overhaul and then sailed to the Victoria Machinery Depot in Victoria, Canada, for conversion to a luxury cruise vessel. 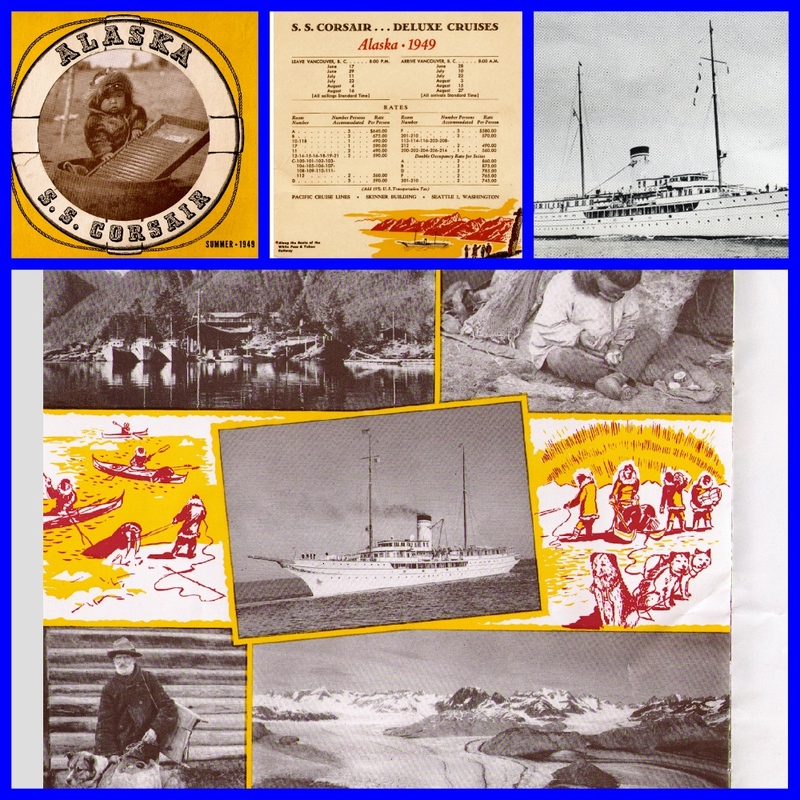 CW: The Corsair – Docked; Sailing in Alaska; In Alaska; Acapulco. In charge of her interior was the firm of William F. Schorn Associates of New York. Schorn was also responsible for giving the pre-war Moore-McCormick Liners cruising to South America from New York – Brazil, Argentina, and Uruguay –a much more contemporary look. He provided the same meticulous detail to designing the modern accommodations for the new elegant Corsair. This was not just a paint job but also a total conversion for the former Morgan yacht to create elegant surroundings for the line’s future passengers. The Corsair docked in Los Angeles waiting for passengers; The Corsair outside of Los Angeles. The goal of Pacific Cruise Lines was to offer to the traveling public the world’s most luxurious cruise ship. The many letters received from the cruise passengers during the first year of service attested to that accomplishment. CW: Corsair Engine Room; Corsair Galley; Corsair Chef; Corsair Acapulco. 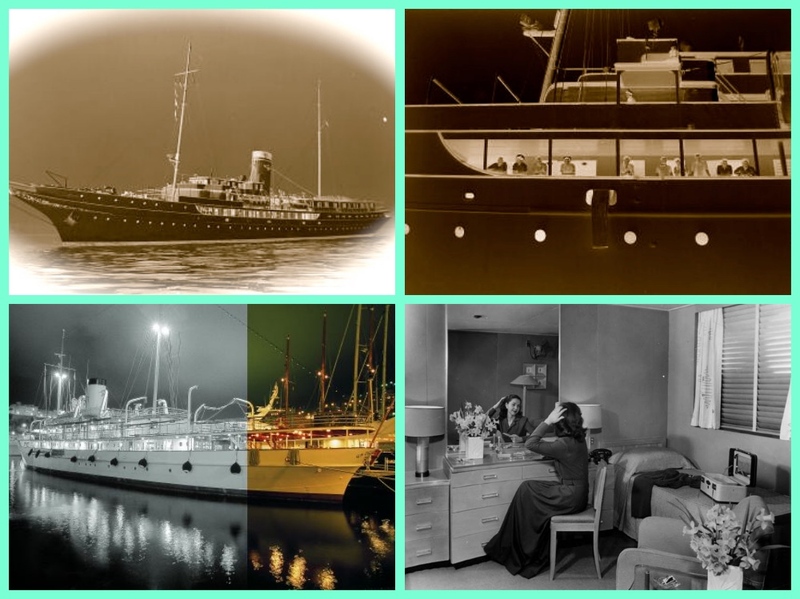 Accommodating only 82 First Class passengers, all rooms were much larger and more commodious than as expected on shipboard at that time. No expense was spared in furnishing decorating each room with the very finest of materials and artistry available. There were no berths on the Corsair, and all staterooms featured beds. Each room had its own private bath. 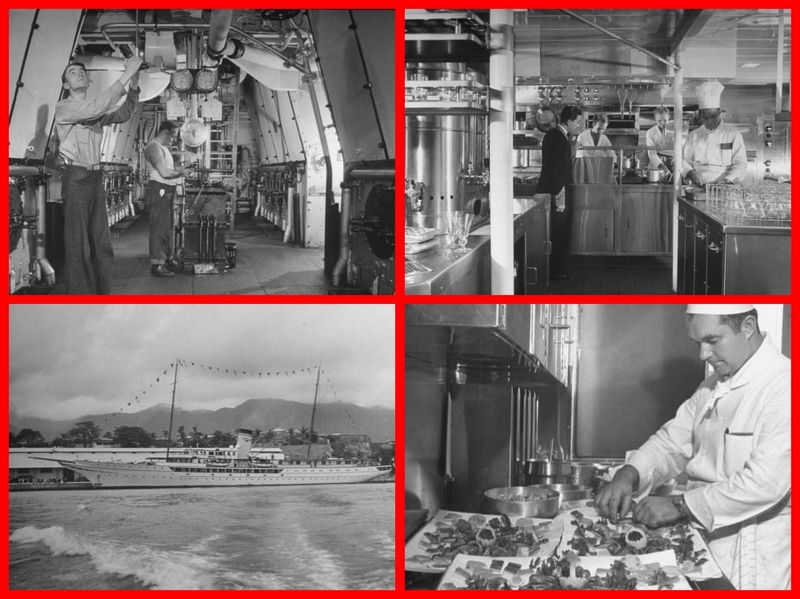 There were a total of 42 rooms on the ship, and the steward’s department personnel alone numbered more than forty. CW: The Corsair; the Corsair passengers on the promenade; Passenger in her suite; the Corsair ready to sail from Los Angeles. Each was responsible for the sole purpose of catering to the slightest desire of the carriage trade passengers. All public rooms, including the main lounge, forward observation lounge, cocktail lounge, etc., were completely carpeted and air-conditioned. This was also true of all bedrooms, sitting rooms, and suites. Top European chiefs were hired to create haute cuisine. A total of 76 crewmembers and officers were aboard the new cruise ship, making the passenger to crew ratio almost one to one, equaling or surpassing the most high-end cruise ships operating today. 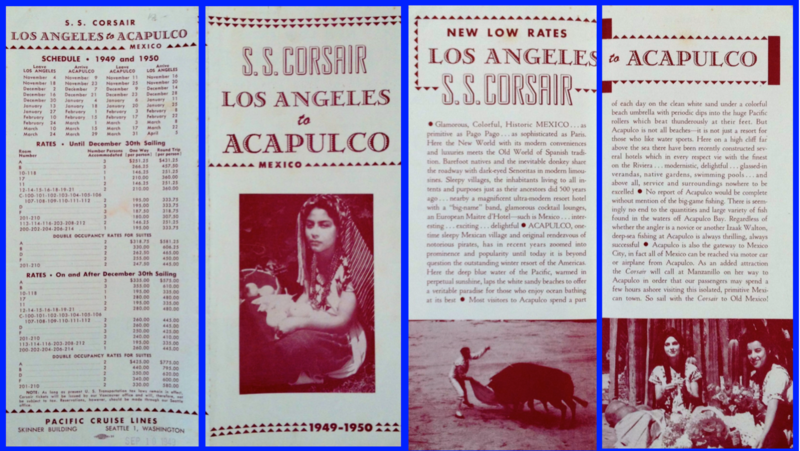 The new Corsair made her debut on September 29, 1947 offering two-week cruises from Long Beach, California, to Acapulco, Mexico. The standard price per person rate averaged $600. Hardly a bargain since the ship’s cruise fare equaled more than a quarter of the 1947 typical U.S. family income. The new cruise line placed attractive full-page ads for cruising on the new stylish first class Corsair in Holiday magazine. Demand for passage was heavy and the waitlists lengthy. During the summers of 1948, the Corsair was switched to Alaska. Sailing out of Vancouver, British Columbia, she provided the first deluxe two-week cruises ever offered to the Inside Passage. Another first for the Corsair Alaska cruises was a specially chartered train transporting passengers from Whittier to famed McKinley National Park. A series of cruises to Mexico, Havana via the Panama Canal and the Gulf of California were scheduled and completed in the spring of 1949. The cruise ship returned to Alaska for summer sailings and was to be followed by a season of cruises to Mexico from Long Beach beginning in October. Then tragedy struck on November 12, 1949. 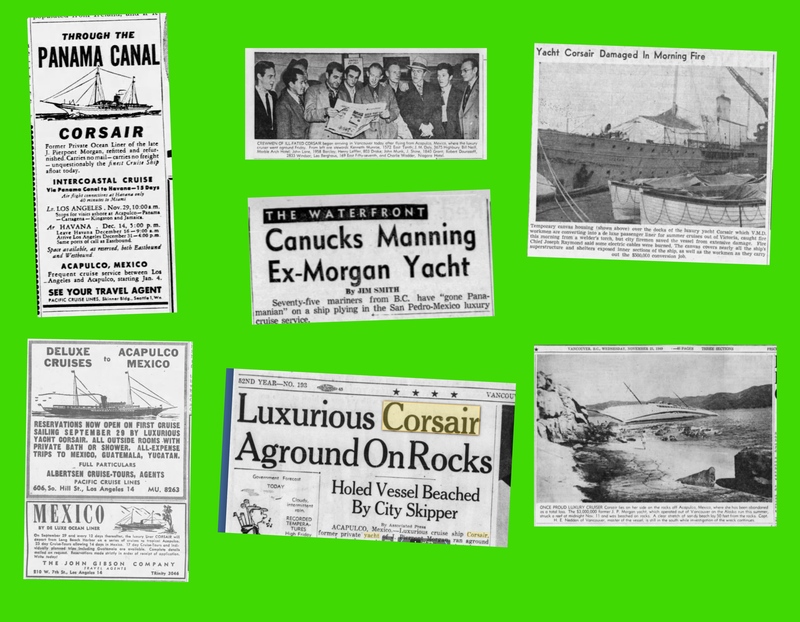 News clippings from the new cruise ship Corsair to the tragic end. The Corsair, during one of her autumn Mexican Riviera cruises, struck a rock and beached at Acapulco. 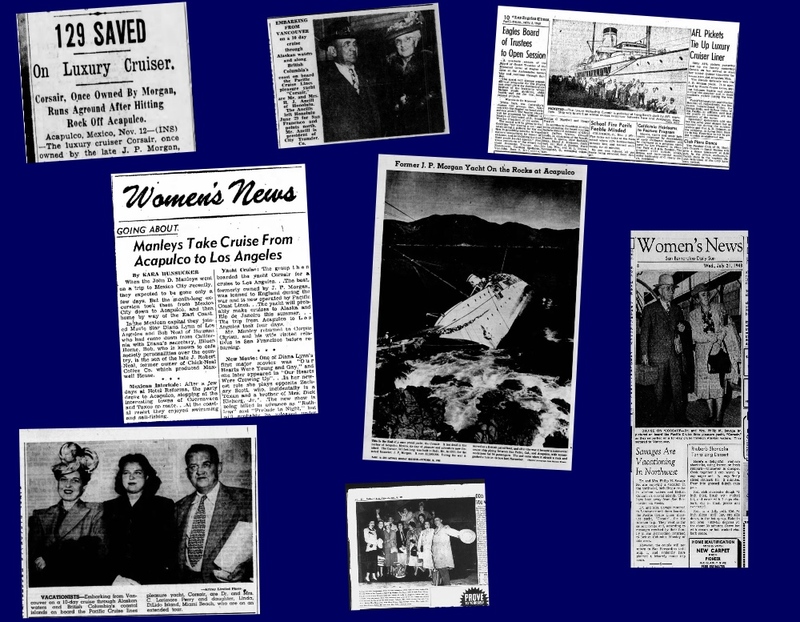 Her crew and 55 passengers were put ashore in lifeboats. CW: The Corsair beached in Acapulco; Corsair wrecked; Corsair launching; Corsair a loss. There was no loss of life. Examined by her owners, the former Morgan yacht was determined to be a total constructive loss and abandoned to Davy Jones’ locker. It would be more than 15 years until Princess Cruises began offering sailings to Mexico with a regular year ’round service would be offered. There would be numerous attempts to offer Mexico cruises in the meantime. At least five different cruise lines didn’t make it. Even during this age of mega-liners, no other ships will ever equal the elegance, exclusivity, and style of the former Morgan yacht. The Corsair’s legacy lives on only for divers willing to explore the remains of the vessel deep in the warm seas off Acapulco. Next: Sailing to West Africa on Elder Dempster’s liner MV Aureol.